If you search your ancestors in Siracusa, Sicilia, info about your Italian family are stored in the City Office archives or at the parishes. In towns and villages of Sicilia and in Siracusa province registry offices were established around 1820: it means that you could find information in Siracusa registrar as of that date. So, if your ancestors were in Siracusa in the nineteenth or twentieth century, then you could try to contact the City Office of Siracusa to know more. 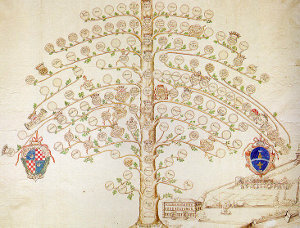 Before to start your genealogy research in Siracusa, we suggest you to read our tips for your search . They are useful to search in sicilia and in Siracusa too. 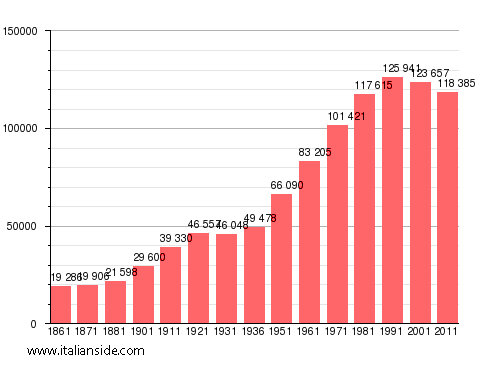 Next picture shows the demographic trends in Siracusa from the Italian Unification (1861) an important info to understand how many people lived there in the past. It could be important to know if the last name you are investigating is a frequent surname in Siracusa. As more your surname is common in Siracusa, as more it could be difficult to find the right info about your ancestors in Siracusa archives if you have not exact dates. If you have the opportunity to visit Siracusa and Siracusa province, you could plan to investigate churches’ archives by yourself (or with us! ), but from abroad is very difficult to obtain any result unless you find a reliable local help. If you have the opportunity to visit Siracusa and Siracusa province, you could plan to investigate churches’ archives by yourself, but from abroad is very difficult to obtain any result unless you find a reliable local help. If your research is in a dead end and you need professional help from our local Italian genealogists write to siracusa@italianside.com our expert in Siracusa area will study your request and will reply to you with a research plan and a quote. I’m working on getting all the documents I need for my Italian citizenship by descent. I have been doing some massive searching! So from what I’ve gathered – in regards to documentation from Italy – I need the birth certificates of my great great grandparents (I have guesses of where they were born, but it’s not certain) and their marriage certificate. All other documentation I think I can only get from the US. Then my great great grandmother – (the spelling for her name has been different everywhere I look but I’m 99% sure I have it correctly) Filippa Zisa-Vasile. I think she was born in Siracusa 4 Nov 1877. I also think that they must have gotten married in Siracusa as well, as their first born son, John Vasile, was born in Siracusa 10 October 1903. For additional information, I don’t know Guiseppe’s parents or really any other information about him. But Filippa I do have some information. I know her parents names and birthday too. As for a year of the marriage, I’m really not very sure. That’s the information I’m looking for and need. But again the towns I’ve said above are educated guesses. My name is John Vasile,and I am the grandson of John Vasie, who was Giuseppe and Filippa’s eldest son. To whom are you related? My great , great grandfather, Guiseppe Vacante and his wife Carmella departed Sicily for America in 1885. They took with them there three children, Tomassino, Guiseppe and Francesco. I was wondering if I still have distant relatives in Sicily and particularly in the Siracusa area where they were from. We will be visiting Sicily in June of 2018. Any and all guidance is appreciated. Hers. I am trying to find this information for her grandaughter who is elderly now. If you would like to start a research in Siracusa please send your request to siracusa@italianside.com.